Are You Climbing the Ladder, or the Lattice? Imagine this: you are at a local restaurant having lunch. You strike up a conversation with your very capable server and are so impressed with her attitude and potential, you think “I need this person on my team!” Then you actually recruit her! Well, that’s exactly how Sue Ceglinski, Director of Talent Acquisition for US Pharmacopeia originally started her career over 20 years ago – she was that server! Sue eventually made her mark in that early role as a Physician Recruiter, then CSC, SAIC, and Northrup Grumman before joining US Pharmacopeia, where she leads TA globally today. USP, based in Rockville, Maryland, develops and disseminates public quality standards for medicines, vitamins, and foods, to keep millions of people safe and healthy globally. An important mission indeed, giving Sue and her team plenty of interesting STEM and Corporate talent challenges. In my most recent Big Fish in the Talent Pool Podcast, Sue gives us her perspective on the very special regulated industries she has hired for and led, as well as some unconventional career advice. Like the importance (or not) of a job title. Or how taking one step back to go two steps forward can open up a whole new world career-wise for those willing to climb the “lattice” rather than the “ladder”. Sue is self-aware and bold, happily sharing the nuggets of career wisdom she’s gained, without taking herself too seriously. 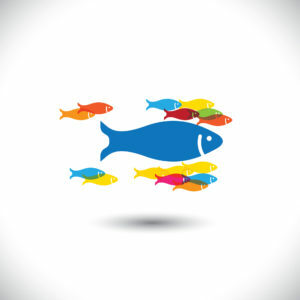 It’s a privilege to do what we do in Talent Management and Acquisition, and it’s our hope that by conversations with these “Big Fish” make you even more passionate about doing it well! Big Fish in the Talent Pool can be accessed on iTunes or Soundcloud. Enjoy!